On the left are meshed pictures of the back walk made of pavers and the front walk of freeform limestone. 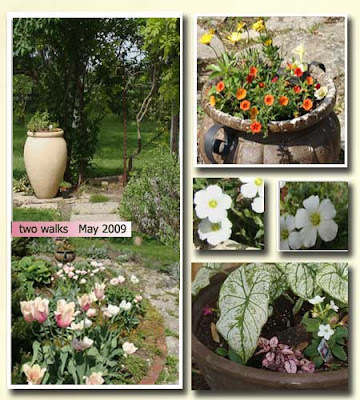 Upper right is a picture of a just planted container with the Lemon Symphony osteospermum, middle are two views of Arenaria montana growing along the arbor walk. Last, is a part shade container grouping of caladium, polka dot plants, and nicotiana, Domino hybrids. Good Evening: Just stopped in for a visit enjoyed looking at you photos. That is my thing lately- once I’ve posted more of my backlog of photos will resume writing articles. Our gardening season is just getting underway. This is the big weekend, garden centres all open today. wordy chunks.%} still looking forward to your trip south! j.
I like that you incorporate containers in with your beds. Very pretty. Cheers! I dug a couple holes in the red GA clay. Will plant a couple azalea bushes… mulch well and hope for the best. This is my daughter’s place… and we need to get her a few tools; can’t keep up the garden without good tools.